One of Allo's highlight features is Smart Reply, where the app guesses what you might respond to a message with, and adds a button to send that response. 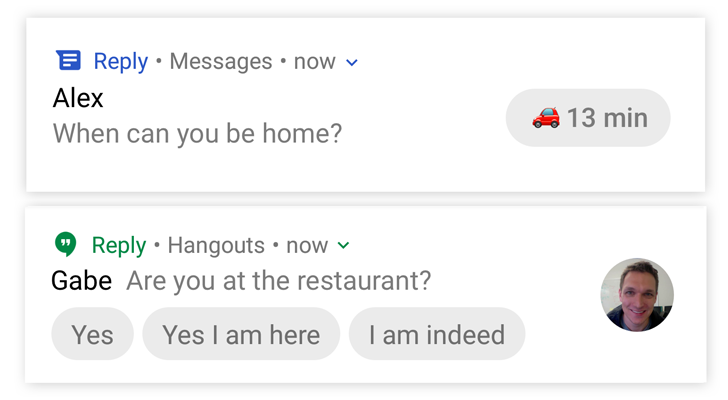 A few other apps have implemented it as well, like Android Messages, but usually not in notifications. Google seems to be testing an app called 'Reply,' which adds smart replies to other messaging apps. You probably get a lot of chat messages. And you want to be there for people, but also for people in the real world. What if replying were literally one tap away? Don’t miss the important stuff. When you get an urgent message like “We’re waiting for you!” Reply can make sure to get your attention even when your phone is silent. Vacation responder. Reply can check your calendar and tell people if you’re not working. Your Favorite Chat Apps: Reply works with Hangouts, Allo, Whatsapp, Facebook Messenger, Android Messages, Skype, Twitter DMs, and Slack. At least part of Reply's functionality may be coming from Gboard, as a recent teardown revealed that an identical feature was in development. Perhaps the Reply app activates some functionality in Gboard, or the app is for people who use another keyboard. If you want to sign up for details, the email links to this form, which you can fill out to receive more information. The app hasn't actually been sent out to anyone, so we don't have an APK quite yet.